"In today’s inter-connected world it’s now a standard feature for devices to have Bluetooth connectivity. However, what if you have older devices in your home that do not have this feature? Fortunately, the solution to this is quite simple. All you need is a Bluetooth transmitter." If you want one single adapter to cover every last one of your bluetooth needs, look no further than the Avantree Oasis. We’re fans of Avantree here even if you havent heard of them, see our Bluetooth Noise-Canceling headphone review. It’s meant to serve as a Bluetooth hub for your entire home – it’s a transmitter and a receiver, and both functionalities operate at ranges up to 160 feet. The oasis supports both RCA/3.5mm aux audio connectivity AND digital/optical audio input and output – there’s hardly an audio device on the planet that won’t be compatible with this workhorse Bluetooth hub in one way or another. This transmitter/receiver also features aptX Low Latency support, which effectively eliminated that annoying audio lag you can get with traditional Bluetooth dongles. Lastly, the Oasis features multipoint connectivity so you can have Bluetooth streaming to, say, two different pairs of headphones at the same time – definitely a game changer when it comes to Bluetooth transmission technology, and an absolute necessity for any bit of hardware claiming to serve as a hub for all of your Bluetooth connectivity. This model is definitely the best bluetooth transmitter for TV use, period. [NO LIP-SYNC DELAY]: Supports the aptX Low Latency codec to virtually eliminate audio-visual lag making the Oasis an ideal choice for watching TV / movies. For best results, use with aptX Low Latency supporting headphones / speakers, like the Avantree Audition Pro and Torpedo Plus. [EASY TO USE]: The Oasis supports full-featured voice guidance and status / codec indicators, making it incredibly easy to set up and use. Supports digital OPTICAL / AUX / RCA audio output standards making it compatible with 99% of the TVs on the market. Connect the Oasis in between your TV and soundbar - then use the convenient Bypass switch to choose between your soundbar (Bypass mode) and streamed audio (Bluetooth mode) without the need to plug/unplug any wires. We’ve given stellar reviews to TaoTronics’ Bluetooth gear in the past, and this transmitter/receiver combo hold up to that praise! To begin, the unit is a sleek black box that fits in to any electronics array subtly and stylishly. Right out of the gate, the TaoTronics model comes with all of the cables you might end up using with it – an optical digital cable, a 3.5mm aux audio cable, the usb charging cable, and a 3.5mm to RCA cable. Always a good sign! From a functionality point of view, this adapter can pair with two headphones/speakers at once as needed, supports standard 3.5mm connectivity as well as optical / digital (TOSLINK) connectivity, and ships with low audio latency aptX Low Latency technology. 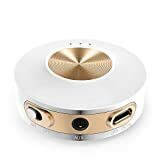 This is a big deal when it comes to streaming audio from your TV to a pair of headphones, as it eliminates any sort of audio synchronization issues you may otherwise encounter. Last but not least, there is an internal battery inside of the TaoTronics unit that gives you up to 15 hours of use off of a single charge. You can also use the device while it’s charging, which is both a must and a thankful derivation from the norm when it comes to Bluetooth dongles in 2017. Similar to the first two units on our list, this Ubittek model is both a Bluetooth transmitter and receiver that supports all of the most modern functionalities and technologies, like aptX Low Latency audio streaming, support for both analogue and digital audio input/output, automatic repairing, and multipoint pairing so you can stream to/from more than one device at a time. Stylistically I’m a big fan of Ubittek’s offering. It’s a nice matte black color, and it feels quite sturdy when set flat on a counter or desktop. Some of these Bluetooth transmitters tend to get knocked and slid around quite easily, so it’s good to finally see one that stay in place after it’s put down. The rechargeable battery nets you 15 hours of solid use on one charge, and the Ubittek advertises a 33-foot maximum streaming range. I’ve found this to actually be a bit of an underestimate, as I’ve streamed comfortable and without clarity issues from 40+ feet away. This likely just depends on your setup, however – there was nothing in the direct way between the transmitter and my headphones when I was using it. Avantree’s Class 1 portable transmitter is the first transmitter-only on our list. It’s meant to serve as a “base of operations” for your home media setup, serving as an easy way to stream Bluetooth audio to your headphones or from your indoor media center to outdoor Bluetooth speakers. 7 hours of promised battery life will serve you well, and I’ve actually gotten up to ~10 hours of use off of one charge with this little guy. The unit itself is a pleasant white color, a refreshing take on the all-too-often black audio equipment you’ll find when shopping around. This model offers connectivity up to 100 feet, which is perfect for indoor-outdoor connectivity no matter where your speakers / media center are set up. It also supports aptX Low Latency technology for perfectly synchronized audio, and can push audio to two different receiving devices at once. Portable use with 7-hour battery: need a Bluetooth transmitter for outdoor use? With a built-in battery that holds up to 7 hours of power, this is a perfect option for both streaming and charging at picnics, barbeques, parties and more! 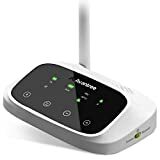 Reconnects automatically: spend more time enjoying your music, TV and games - and less time setting them up with this easy-to-use Bluetooth transmitter. Simply switch it on, and you'll see it powers on and enters pairing/ RECONNECTION mode automatically. Easy! The Nulaxy Wireless In-Car Bluetooth FM Transmitter Radio Adapter is the best bluetooth transmitter for car use, and it’s definitely the most unique offering on our top 5 list. 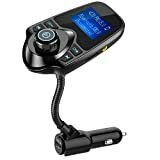 It’s meant specifically for auto use, and allows you to stream Bluetooth audio from your phone over your cars speakers via standard 3.5mm aux cord connectivity, or – even cooler – by syncing the device up to a specific FM frequency and tuning directly in to your music on that frequency using your car’s radio. In other words, if you’re driving around something that doesn’t have a built-in aux port, the Nulaxy Bluetooth transmitter offers an affordable, simple, and surprisingly high quality way to get your music playing over your car’s speakers. The device comes with a 5V-2.1A charging setup for easy car charging, and features a 1.4 inch LCD screen and dedicated media controls so you can simply set and forget your phone and use this cool little device for all the rest when driving. It also boasts a built-in microphone for hands free phone calls, it supports a TF / MicroSD card for playing music directly off of your local storage, and it plays all of your audio at crystal clear levels. If you’re just looking for a transmitter to work specifically with your car, the Nulaxy is a fantastic choice! What is a Bluetooth transmitter? Simply put, it is a device that you use to wirelessly connect two different devices together with a push of a button. You can even use it to connect a Bluetooth ready device with another that does not have Bluetooth capabilities. If that sounds like something you will definitely need in your home then you have come to the right place. In this article, we will discuss the important aspects of a Bluetooth transmitter and what you should look for if you are planning to buy one. Before we dive headfirst into the Bluetooth transmitter landscape, let us first take a quick stroll down the history of this helpful technology. Did you know that Bluetooth technology was invented way back in 1989? It was developed by scientists that worked for Ericsson Mobile. The term Bluetooth was based on a 10th-century king named Harald “Blatland” Gormsson who introduced Christianity to the Danish tribes and helped unite the region. A perfect name for a technology that advanced wireless connectivity by leaps and bounds, don’t you agree? It was not until 1997 when Intel signed the scientist to market this technology which then made it public the year after. While the popularity of Bluetooth technology had a slow rise, once it did, it became integrated into all electronic devices. Today, Bluetooth is now a mandatory feature for all gadgets and home entertainment devices. Before buying a Bluetooth transmitter it is vital to first determine what and how you will use this device. Transmission range and fidelity are two of the most important factors to consider. Most Bluetooth transmitters come with a USB charger that you can plug into your wall socket or to a power source with a USB slot of its own. As for extra features, some will incorporate a stereo jack connection, compatibility with various smartphones and an exceptionally long battery life. Most portable Bluetooth transmitters can last up to 10-hours with a fully charged battery. You should also be aware of the transmitter’s VDC frequency range. The number of apps it will and the size of the device will also factor into your decision. If you will be getting a portable one then it must be durable with a long battery life. It should also be compact and lightweight for easy transportation. A safe choice would be a Bluetooth transmitter with a powerful VDC range and is compatible with almost all devices. If you want a compact design a transmitter that is around 2-inches thin would be a good choice. The Bluetooth transmitter’s range all depends on the type of class it falls into. You have the Class 1 which delivers around 100 meters or 330 feet range while the Class 2 transmitters will offer up to 10 meters or 33 feet. The most common Bluetooth transmitter in the market is Class 2 which is good enough for use at home. If you need something with a significantly larger range then go for the Class 1 Bluetooth transmitter. However, you should also note that the 100-meter range of Class 1 adapter is only attainable as long as there are no obstacles to dampen the Bluetooth signal. Always go for a Bluetooth transmitter that is reliable when it comes to its support of various devices in the market. It should be able to work with different Bluetooth devices such as wireless mouse, headsets, printers, smartphones, and tablets. An essential feature that a Bluetooth adapter should have is its wide range of compatibility. It should be able to pair with various devices that use different OS. For example, get a Bluetooth transmitter that can be used with both PC and Mac computers. It should also be able to connect with different OS versions from Windows XP to Windows 10, Windows 2000, 2003, Vista and ME (32 and 64 bit) as well as Mac OS. There have been various iterations of the Bluetooth technology so it is best you get an adapter that has the latest one installed. We are already at version 5 now which was just recently launched last April of 2017. The most common version one right now is Bluetooth 4.0 which is backward compatible with older versions down to version 1.1. Hopefully, we will be able to get devices that have 5.0 installed as it doubles the transfer speed (2mb/s) and an enhanced range and data broadcasting capability. If you are looking for a worthwhile Bluetooth transmitter then always check the protocol version. 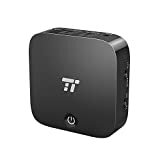 Get one that utilizes the 4.0 version or higher as this will deliver significantly faster transfer rate, wider range and is compatible with devices that still has older Bluetooth versions. The other features we discussed above should also be on your radar when checking out a Bluetooth transmitter. If you are planning on getting a portable one then always look for one that has a decent battery life and has a compact design. There are literally hundreds of Bluetooth transmitter products to choose from in the market and knowing precisely what features you need to look for is vital if you wish to land on the best possible choice. As always, it is essential to first familiarize yourself with the product you wish to purchase in order for you to narrow down your list to the best possible products in the market.